Most of the work I undertake is by commission. I specialise in scratch-building models of proprietary buildings, often buildings that have long-since been demolished. 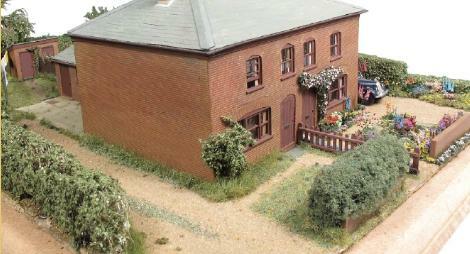 In many cases I am asked to set the building within in a diorama sized to fit a precise area of a layout – as in the Gosberton Crossing cottages (see bottom left) with their contrasting gardens or the Gosberton goods shed with the shunting horse waiting patiently for the next job (left). Every project is different, often with some specific requirements from the client to be incorporated in the finished piece, so each project begins with a no-obligation conversation to scope the client’s ideas in order to arrive at a quotation. Once the project details have been agreed and the build begins I keep in regular contact with the client, often referring back to discuss specific fine details as they crop up, until the piece is complete. If you are considering a project and wish to discuss your ideas for structures, just email me at: enquiries@bespokemodelbuildings.co.uk and we’ll arrange a convenient time to speak.